As we told you last week, we're starting a new feature on our blog - every week, we'll post a picture or illustration here reminding you of the consequences of passing Initiative 912. Remember: If we roll back funds to replace critical structures like the Alaskan Way Viaduct and the SR 520 bridge, then we put ourselves at risk for a disaster in which there will be death and massive destruction. A collapse is the future of unsturdy bridges and critical structures across Washington State if we don't act. An earthquake could strike at any time. It happened in California; it could happen here. The longer we wait, the greater our risk. 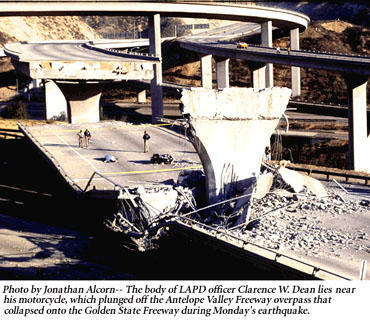 The photo to the left shows a collapsed section of the Antelope Valley Freeway. The collapse occurred after an earthquake struck the Los Angeles area. Washington, like California, is prone to earthquakes. Chelan County - US 2/Wenatchee River Bridge at the Tumwater Canyon. Replace the existing bridge with a new bridge designed to current standards ($10 million). Chelan County - US 2/Chiwaukum Creek west of Leavenworth. Replace the existing bridge with a new bridge designed to current standards ($7 million). Clallam and Jefferson Counties - Replacing the east half of the SR 104 Hood Canal Bridge with a new bridge designed to current standards ($162.1 million). Cowlitz County - Replace the Abernathy Bridge over the Grays River with a new bridge designed to current standards and realign Cameron Creek Road at the west end of the bridge ($15 million). Grays Harbor County - Replacing the existing US 101 W Fork Hoquiam River Bridge with a new bridge designed to current standards ($3 million). Grays Harbor County - Replacing the SR 109 Moclips River bridge north of Hoquiam. This existing bridge traps debris. The replacement of the bridge will eliminate the need for repetitive channel clearing of logs of other types of debris ($2.6 million). Island County - Replacing the SR 532 Gen Mark W Clark Memorial Bridge near Stanwood with a new bridge to meet current design standards for safety and capacity ($18 million). Lewis County - Replacing the SR 6 So. Fork Chehalis River Bridge with a new bridge designed to current standards ($6.7 million). Lewis County - Replacing the SR 6 Rock Creek Bridge with a new bridge designed to current standards ($6 million). Mason County - Replace the existing SR 3/Fairmont Ave to Goldsborough Creek Bridge with a new bridge to meet current design standards, reduce the chance of collisions and accommodate the increased capacity ($9.9 million). Spokane County - Replace the SR 290 bridge over the Spokane River with a new bridge designed to current standards ($34 million). Replacing the SR 542 Boulder Creek Bridge along the Mount Baker Highway with a new bridge designed to current standards ($5.2 million). Whitman County - Replacing the SR 195 Spring Flat Creek bridge in Colfax with a new bridge designed to current standards ($4 million). Replacing the SR 27 Pine Creek bridge east of Oakesdale with a new bridge designed to current stands and raising the roadway to mitigate periodic roadway flooding ($4 million). Yakima County - Replace the existing SR 241 Dry Creek bridge north of Sunnyside with a new bridge designed to current standards ($2 million). Yakima County - Replace the existing US 12 and Tieton River West crossing west of Naches with a new bridge designed to current standards ($600,000). Yakima County - Replace the existing UW 12 and Tieton River East crossing west of Naches with a new bridge desgined to current standards ($400,000). I just pulled these seventeen projects off the WSDOT list of projects funded by the 2005 transportation package. And guess what? None of the above seventeen bridge replacement projects are in King County. Or Pierce or Snohomish Counties, for that matter. The next time you hear someone say that the transportation package only benefits Seattle and or I-5, swat them in the face with this list of bridge replacement projects. This package benefits all of Washington State. If you care about safe bridges and safe roadways, vote NO on Initiative 912.